Outlawed now, Shareem eke out a living in the back streets of their city, restricted by rules that keep them near-prisoners, each searching for the one woman who will fulfill his long-denied need for love. 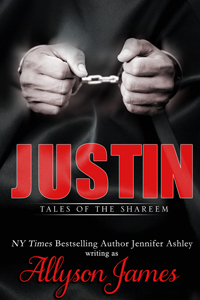 Justin has spent much of his life as a free citizen, but he returns home to search for the daughter he was forbidden to have. But the fiesty female patroller following him around is getting in his way, especially when she keeps shooting him in the backside. Justin needs to protect his secrets, but he decides that the patroller is worth a second look, and maybe some instruction in level-two games. He sets out to seduce, but discovers that Deanna, his pretty patroller, has a few surprises in store for him. Deanna can’t understand why the exasperating Justin won’t follow the rules, considering the trouble he keeps getting himself into. She also can’t understand why he excites her so much–patrollers are supposed to tame Shareem, not fall for them. But as Deanna uncovers his secrets, she learns exactly what Justin has given up, and what kind of courageous man lies behind the façade of the pleasure slave.